December 23, 1905 – President Joseph F. Smith dedicated the Joseph Smith Memorial Cottage and Moument at Sharon, Windsor County, VT., the site of the Prophet’s birth 100 years earlier. The property had been purchased by the Church earlier in the year. 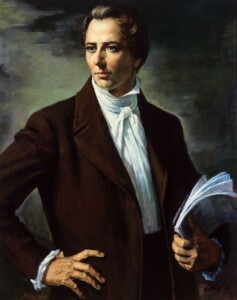 December 23, 2005 – Culminating a yearlong celebration of the 200th anniversary of the birth of the Prophet Joseph Smith, the Church held a commemorative satellite broadcast that featured segments from the prophet’s birthplace in Vermont, as well as from the Conference Center in Salt Lake City. The commemorative program was telecast to 161 countries by satellite and worldwide by Internet, with the proceedings translated into 81 languages. December 2006 – The Prophet Joseph Smith and President Brigham Young were included on a list of the top 100 “Most influential figures in American history” printed in the December issue of Atlantic Magazine. November 5, 1895 – By a vote of 31,305 to 7,687, the people of Utah ratified the constitution and approved statehood. The documents were later hand-delivered to President Grover Cleveland. November 5, 1896 – The First Presidency issued a formal letter of instruction directing that the first Sunday in each month be observed as fast day, rather than the first Thursday, which had been observed as fast day since the early days of the Church in the Utah Territory. November 5, 1903 – The Carthage Jail was purchased by the Church as a historic site for $4,000. November 5, 1933 – The First Presidency and four members of the Quorum of the Twelve participated in the dedication of the Washington, D.C., meetinghouse, which was adorned by a statue of the Angel Moroni atop its 165-foot spire. November 5, 1985 – President Spencer W. Kimball died in Salt Lake City at age 90. November 5, 2000 – Following a procedure established by the Prophet Joseph Smith for the cornerstone laying of the original Nauvoo Temple April 6, 1841, President Hinckley presided over the dedication of the four cornerstones of the Nauvoo Illinois Temple. October 31, 1838 – Joseph Smith and others were made prisoners of the militia. The next day a court-martial ordered the Prophet and the others shot, but Brig. Gen. A.W. Doniphan refused to carry out the order. October 29, 1839 – Joseph Smith left Illinois for Washington D.C. , to seek redress from the president of the United States for wrongs suffered by the Saints in Missouri. October 29, 1855 – In a general epistle, the First Presidency proposed that Perpetual Emigrating Fund immigrants cross the plains by handcart. October 29, 1979 – The first two converts of eastern Africa were baptized in Kenya. Categories: Church History	Tags: converts, handcart, Joseph Smith, Kenya, Perpetual Emigrating Fund, Washington D.C.
September 21-22, 1823 – In five visits with Joseph Smith, the resurrected Moroni revealed the existence of ancient gold plates, from which the Book of Mormon was translated, and instructed him on his role in restoring the gospel. How did the U.S. press react when Joseph and Hyrum were murdered? Larry C. Porter, director of Church History, Religious Studies Center, Brigham Young University. As we know, a double murder was committed on the hot Thursday afternoon of 27 June 1844 at Carthage, Illinois. The Prophet Joseph Smith and his brother Hyrum were slain in a violent outburst by an armed mob of one-hundred to two-hundred men. The attackers were primarily members of the Warsaw (Illinois) militia, aided and abetted by certain of the Carthage Greys who had been posted to guard the prisoners. Newspapers in every state and territory of the Union alerted their readership to the assassinations. Even a cursory examination of the sources yields an impressive amount of newspaper coverage. The Morse magnetic telegraph had been in operation for only one month at the time—and only between the cities of Washington and Baltimore. But the western mails dispatched news of the slayings with surprising rapidity. The news reached the papers in St. Louis, Missouri, in two days; Cincinnati, Ohio, in six; New York City and Washington D.C., in eleven; and Boston in twelve. The village of Palmyra, New York, near the site of the Hill Cumorah, learned the preliminaries of the murders in thirteen days. The papers in Windsor County, Vermont, where Joseph and Hyrum were born, carried an account of their deaths fifteen days after the fact. Of course, towns closer to Nauvoo received the word more quickly. A Quincy newspaper, forty miles south of Nauvoo, notified its citizens on June 28, one day after the murders took place. The people of Warsaw, Illinois, some eighteen miles down the Mississippi from Nauvoo, received an extended account of the occurrence after two days. Although the murders were known to every inhabitant of Nauvoo, the first extensive coverage in that city of the circumstances appeared three days later on June 30, published in a Nauvoo Neighbor,—Extra, “Sunday, 3 o’clock p.m.” A simple, one-page “Proclamation” had been issued in the city the previous day by Brigadier General M. R. Deming of the Illinois State Militia, inviting the citizens of Hancock County to remain in their homes and cooperate in “establishing tranquility.” This “Proclamation” was published simultaneously in a Nauvoo Neighbor,—Extra, and other newspapers in the area. However, it contained no details concerning the murders, except a note on the return of the corpses. The Saints in Europe had no trans-Atlantic cable and, of course, received the sad news belatedly. Elder Orson Hyde wrote to the “Brethren and Sisters in England” from New York City on 10 July 1844, and the message would have taken between eighteen and twenty-one days to cross the ocean. Elder Hyde’s letter, along with other particulars, was printed in a Supplement to the Millennial Star, August 1844. It is understandable that these and numerous other inaccuracies found their way into print in the midst of the confusion surrounding the actual circumstances at Carthage. Some of the misconceptions were corrected as more reliable information became available. However, certain of the erroneous reports were allowed to stand without being corrected in subsequent issues of the particular newspaper, thus perpetrating a misrepresentation of facts. “In fact, the Press of St. Louis denounces this bloody deed, without a dissenting voice.—St. Louis Eve. Gaz. on the 1st. It was with cause that the Warsaw Signal (Warsaw, Illinois) attempted a lengthy justification for the slayings. Its editor, Thomas Sharp, had a very personal involvement in the assassinations. He and eight other men were subsequently indicted for the murders. In the June 12 issue of the Signal—fifteen days before the slayings—Thomas Sharp had reacted violently to the Nauvoo City Council’s destruction of the Nauvoo Expositor. He had cried that a “War and extermination” of the Mormons was “ineveitable” [sic]. Further haranguing his readers to action, he declared: “We have no time for comment: every man will make his own. Let it be made with POWDER and BALL!! !” Thomas Sharp was present at Carthage Jail to assist in the fulfillment of his own decree. In the meridian of time, the Savior had warned his ancient Apostles, “The time cometh, that whosoever killeth you will think that he doeth God service.” (John 16:2.) Whatever their individual motives may have been, there was certainly an overall affirmation on the part of the jubilant perpetrators that a valid service had indeed been performed at Carthage. Time, however, always vindicates the prophets, not their detractors. June 21, 1843 – Illinois agents, armed with a warrant from Gov. Thomas Ford, arrested Joseph Smith at Dixon, Lee County, Ill. He was released July 1, 1843. June 21, 2007 – The Mormon Tabernacle Choir embarked on a tour of the eastern United States and Canada, performing before a total of 50,000 people in nine concerts in seven cities. The choir returned to Salt Lake City July 3.